The Republican Party has been badly damaged in the ongoing government shutdown and debt limit standoff, with a new NBC News/Wall Street Journal poll finding that a majority of Americans blame the GOP for the shutdown, and with the party’s popularity declining to its lowest level. By a 22-point margin (53 percent to 31 percent), the public blames the Republican Party more for the shutdown than President Barack Obama – a wider margin of blame for the GOP than the party received during the poll during the last shutdown in 1995-96. 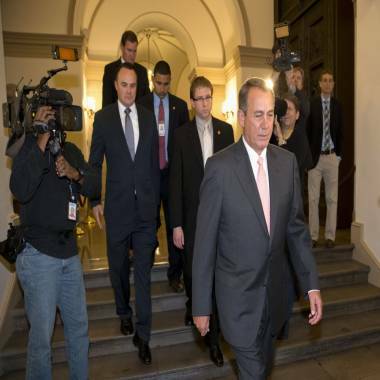 House Speaker John Boehner of Ohio departs the Capitol in Washington, Thursday, Oct. 10, 2013, en route to the White House to a meeting with President Barack Obama. Just 24 percent of respondents have a favorable opinion about the GOP, and only 21 percent have a favorable view of the Tea Party, which are both at all-time lows in the history of poll. And one year until next fall’s midterm elections, American voters prefer a Democratic-controlled Congress to a Republican-controlled one by eight percentage points (47 percent to 39 percent), up from the Democrats’ three-point advantage last month (46 percent to 43 percent). What’s more, Obama’s political standing has remained relatively stable since the shutdown, with his approval rating ticking up two points since last month, and with the Democratic Party’s favorability rating declining just three points (from 42 percent to 39 percent). “If it were not so bad for the country, the results could almost make a Democrat smile,” says Democratic pollster Peter D. Hart, who conducted the survey with Republican pollster Bill McInturff. Yet what is perhaps even more worrisome for the GOP is the “boomerang” effect: As the party has used the shutdown and fiscal fight to campaign against the nation’s health-care law and for limited government, the poll shows those efforts have backfired. For one thing, the health-care law has become more popular since the shutdown began. Thirty-eight percent see the Affordable Care Act (or “Obamacare”) as a good idea, versus 43 percent who see it as a bad idea – up from 31 percent good idea, 44 percent bad idea last month. In addition, 50 percent say they oppose totally eliminating funding for the law, even if it that means a partial shutdown of the government. That’s up from 46 percent who said they opposed that move in a Sept. 2013 CNBC poll. And by a 52-percent-to-44 percent difference, respondents believe the government should do more to solve problems. Back in June, the public was split, 48 percent to 48 percent, on whether the government should do more or less. Republicans and Democrats are debating a possible short term debt extension, but it's uncertain what each side would have to give. NBC's Mark Murray discusses. While the shutdown has wounded the Republican Party, Obama’s overall political standing remains stable in the poll. Forty-seven percent of Americans approve of his job performance, which is actually up two points from last month (though that’s within the survey’s margin of error). That’s compared with just 24 percent who approve of congressional Republicans, and 36 percent who approve of congressional Democrats. Obama – with a 47 percent favorable, 41 percent unfavorable rating – also is the most popular political figure or institution in the poll, surpassing the Democratic Party (39 percent favorable/40 percent unfavorable); Sen. Ted Cruz, R-Texas (14 percent favorable/28 percent unfavorable); Senate Majority Leader Harry Reid (18 percent favorable/32 percent unfavorable); and House Speaker John Boehner (17 percent favorable/42 percent unfavorable). At the bottom of the list are the Tea Party (21 percent favorable/47 percent unfavorable) and the Republican Party (24 percent favorable/53 percent unfavorable) – their lowest favorable numbers in the history of the poll. And 46 percent of respondents say the president, during this budget standoff, has been a strong leader and is standing up for what he believes in, versus 51 percent who believe he’s putting his own political agenda ahead of what’s good for the country. By comparison, a whopping 70 percent say congressional Republicans are putting politics first. “Obama comes into the fight in as good of shape as he entered it,” says Hart, the Democratic pollster. But there is one silver lining for Republicans: By a 43-percent-to-40 percent margin, the public disagrees with Obama’s position that he will not negotiate with the Republicans until they reopen government and raise the debt ceiling. Sen. John McCain, R-Ariz., sat down with Tina Brown at The Daily Beat Annual Hero Summit to talk debt ceiling, shut down, and what's going on in Washington D.C. Beyond the politics, the poll finds that the government shutdown and the debate over raising the debt ceiling have made Americans more pessimistic about the country’s direction and economy. Just 14 percent believe the nation is headed in the right direction – a 16-point drop from last month. In fact, the last time it reached this level in the NBC/WSJ poll was during the 2008 financial crisis. In addition, only 17 percent think the U.S. economy will improve in the next 12 months, which is down 10 points from September. And 63 percent say the budget negotiations between Obama and congressional Republicans have made them less confident about the economy. “All you can say is – what a waste,” Hart says about the government shutdown and fiscal standoff. The NBC/WSJ poll was conducted Oct. 7-9 of 800 adults (including 240 cell phone-only respondents), and it has an overall margin of error of plus-minus 3.5 percentage points.